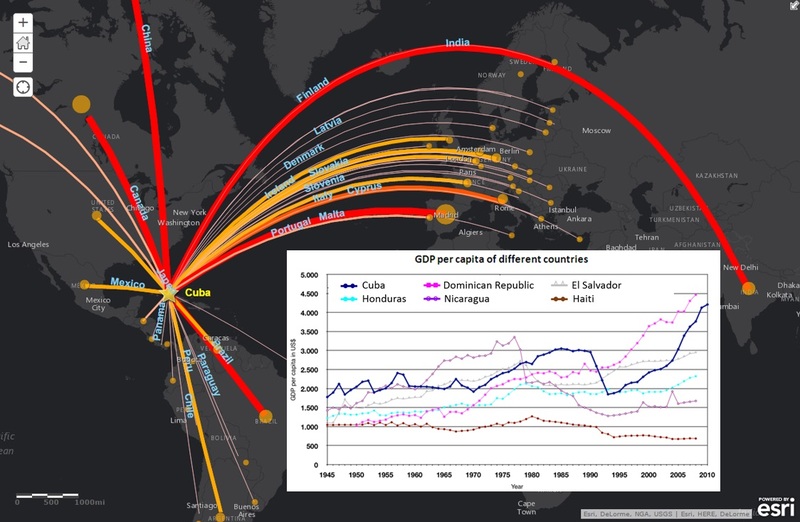 A new story map lets us see what has happened in the past, and what might happen in the future, as the US trade embargo with Cuba is lifted. Finding itself under the magnifying glass of world economists after recent political changes, trade with Cuba deserves a fresh look. Almost a year has passed since the United States and Cuba announced that diplomatic ties would be restored after nearly half a century of trade embargo between the two countries. There are some interesting opportunities for the US and implications for other nations too. One change many economists expect is that US agricultural exports to Cuba will increase, driving economic growth and an appetite for higher-value commodities that will benefit both economies. Let’s take a look at Cuba’s trade through the years and see if we can gain some insight into the future by looking at information from the past. Working with partner Datamyne, we created a new story map to easily view trade statistics. First, here’s the current trade situation in Cuba. Cuba’s economic strength has fluctuated over the last century. Once a flourishing economy in the mid-1900s, Cuba is now only ranked 80th in the world. Cuba’s trade patterns are shown based on 2014 value of trade in U.S. dollars. The thicker the line and redder the color the more trade that country had with Cuba. Today, Cuba has a well-developed, internationally recognized health technology business, but relies almost entirely on other countries for food—about 80% of the food consumed is imported. Cuba’s top trading partners, shown by thick red lines, include Brazil, Canada, China, India, and Spain. Next are European nations including Germany, Belgium, Italy, France, and the UK, displayed by orange and yellow lines. Now that we know the value of trade between countries, let’s look a little closer at what Cuba imports. As a small nation with limited agricultural land to support its population, Cuba relies heavily on imports from other countries. The top 10 import partners are shown with the most important product for each country. The top 10 countries that export to Cuba are shown in color and are identified by their top exported goods. The map underscores the importance of agricultural products in Cuba’s trade. The top imports from Cuba’s top trading partners are, in order of value, U.S. chicken parts (worth US$147,577,736 in 2014), Argentine corn (US$122,395,286), and Brazilian soybean oil (US$69,640,463). 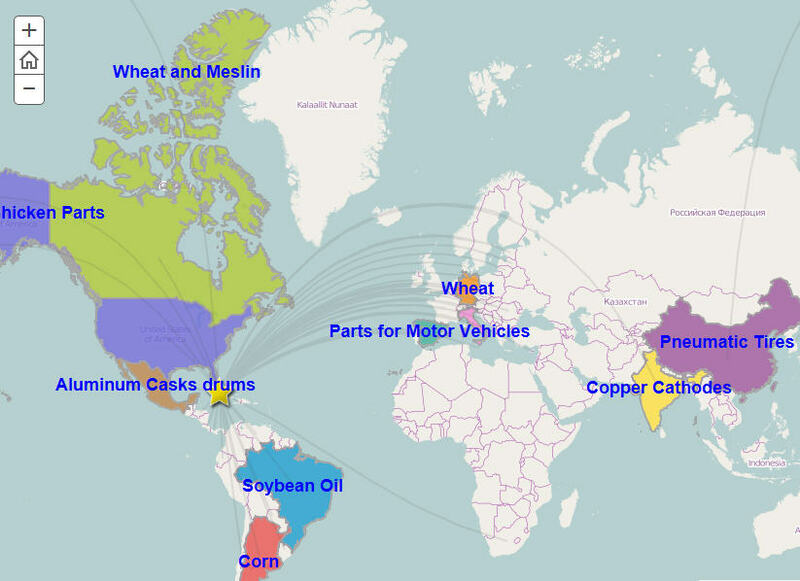 Taken together, Cuba’s wheat imports from Canada (US$60,763,077) and Germany (US$46,415,211) would eclipse India’s copper cathodes (US$68,996,282) … or China’s pneumatic tires (US$33,208,328) and Spain’s auto parts (US$26,977,313) for Cuba’s famous motor vehicles. Wait—doesn’t the United States have a trade embargo in place with Cuba? Then, why did the United States supply not only chicken, but soybean oilcake, soybeans, corn, and animal feed to Cuba to the tune of $300 million in 2014? 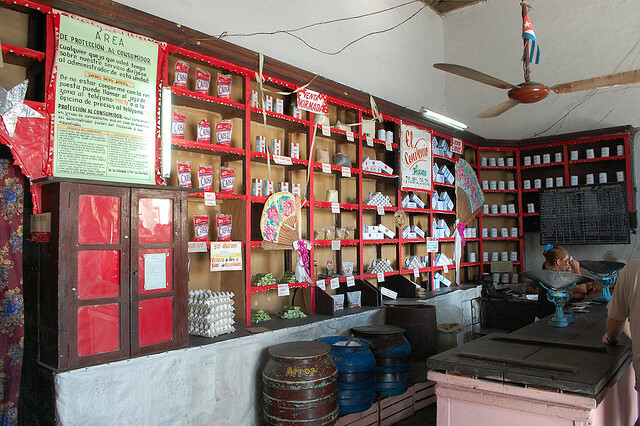 These goods are provided to Cuba under a special series of humanitarian exemptions for consumption by both humans and animals. At first glance this may seem like a large number, but in the context of total market share, US trade with Cuba represents only about 5 percent of a $6 billion trading market—despite being only 90 miles away. If opportunities and regulations open up between Cuba and a geographically close trading heavy-weight like the United States, it very well may impact trade between Cuba and other countries. Could Canada and the US get into a kerfuffle over soybean exports? And how would this change the economy of Canada? Will the US consume all the cigars now going to Spain? Time will tell. What about exports from Cuba? Cuba exports a variety of products, from raw cane sugar to high-tech medical equipment. So, how do imports from Cuba’s top trading partners compare with exports from Cuba? An interesting trifecta of rum, sugar and medical products dominate Cuba’s exports. Cuba’s top export to Canada, one of its top trading partners, is ethyl alcohol made from sugar (US$481,220,751 in 2014). 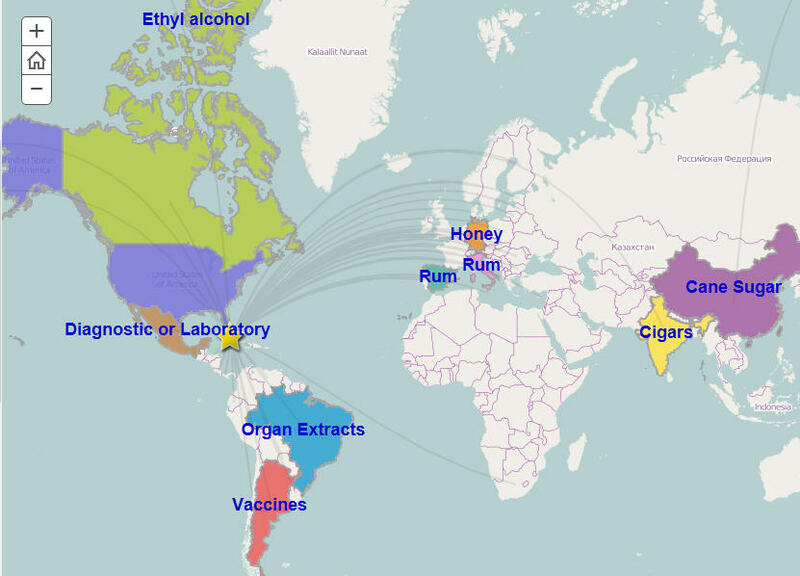 Actually, ethyl alcohol was Cuba’s top export across all markets last year. Sugar cane is the top export to China (US$209,944,579), which last year represented about 60% of the market for Cuba’s second most valuable export. Top exports for Cuba’s top Latin American markets are medical products: Extracts of glands and other organs for organotherapeutic uses for Brazil (US$54,334,743), vaccines for humans for Argentina (US$7,634,667), and diagnostic or lab reagents of Mexico (US$2,741,017). Top exports rum (to Spain and Italy), honey (Germany), and cigars (India) conjure up more traditional images of Cuba. The United States stands out as an exception: because of the embargo, the US imports nothing from Cuba. Cuba gives us some interesting insight into the economic state of the country based on trade patterns and partners. A country known for its austerity, Cuba is importing basic goods from trade partners such as China and India, instead of high-end goods like cars from Germany or fashion from Italy. What has happened? Cuba has found specific trade goods that can be produced at a volume and price that support Cuba’s unique economy. Cuba’s economy is still dominated by traditional products—not the fast-paced consumer electronics we see in many other countries. Looking at Cuba’s trade we see there is no high-tech market or resulting significant import from technology leaders like Japan. The country does not show a demand for luxury products like iPhones or gaming consoles. Instead, Cuba is focused on trading for the essentials and its trading partners profit from high quality raw materials and agricultural products. Cuba smartly began to innovate and differentiate significantly in the 1960s because of the loss of the US as a major partner when the embargo came into force. Cuba also has a highly educated population and has made strong advances in medical and diagnostics. With the inability to cater to demand in the US market Cuba tightened its relationships with many Latin American countries. Today Latin America imports medical supplies and services at a competitive price from Cuba; products and services that compete successfully in quality and technology with other global suppliers. From Austerity to Affordable Luxury? The most interesting map will come in the near future, as the United States opens up its doors to import products and services sourced from Cuba as well as exports more freely into Cuba. The last two tabs in the story map show economic data for the last year. What do you think will be in Cuba’s future? Will traditional partners from colonial times such as Spain be challenged by the close proximity of the American market? Only time—and most likely a map—will tell.